Cyborg beetle: By equipping a giant flower beetle with a processor and implanting electrodes that deliver electrical jolts to its brain and to its wing muscles, scientists have created a living machine whose flight can be wirelessly controlled. A giant flower beetle flies about, veering up and down, left and right. But the insect isn’t a pest, and it isn’t steering its own path. An implanted receiver, microcontroller, microbattery, and six carefully placed electrodes–a payload smaller than a dime and weighing less than a stick of gum–allow an engineer to control the bug wirelessly. 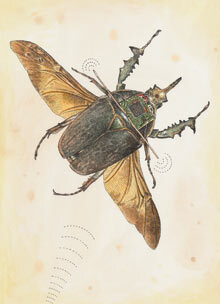 By remotely delivering jolts of electricity to its brain and wing muscles, the engineer can make the cyborg beetle take off, turn, or stop midflight. The remote-controlled beetles are an early success story. Beetles integrate visual, mechanical, and chemical information to control flight, all using a modicum of energy–a feat that’s almost impossible to reproduce from scratch. In order to deploy a beetle as a useful and sophisticated tool like a search-and-rescue “robot,” Maharbiz’s team had to create input and output mechanisms that could efficiently communicate with and control the insect’s nervous system. Such interfaces are now possible thanks to advances in microfabrication techniques, the availability of ever smaller power sources, and the growing sophistication of microelectromechanical systems (MEMS)–tiny mechanical devices that can be assembled to make things like radios and microcontrollers. I know that insects don't have a bill of rights, and haven't signed any treaties, but I really have to question the ethical basis of hijacking living creatures with electrical devices for our amusement. I know, I know, rescues, recon, blah, blah, blah. It still seems like the first step onto a very slippery slope. How long before humans are wiring up dogs, dolphins, whales, illegal aliens...? No need to wire up humans. At least not American. They're simple enough that all you need is Talk Radio to control them. Frank, that is ridiculous. I know you may feel bad for the bugs, but it is obvious society limits things that have questionable ethics. It is a take on what you projected. But Frank, as u may know, technology and science have come to the level that can make creatures feel pleasure as well as suffering, using electrodes. So the ethical problem seems to be solved if the beetles are given the pleasure. We squash millions of bugs a day just because they get in our way. To give you an idea of how many bugs are on this earth, the bats of the world eat more bugs in a week than you could possible count in multiple life times. There are around 1 billion bugs per human being. If we allocated just a few percent of one persons worth of bugs, I'm sure we'd be set. I think what's required is laws granting other creatures rights based on their sentience level. Past a certain point we would not be able to control them. It would be a great step to man's reintegration with nature, and could be a wonderful way to be able to interface with Earth's fellow passengers. If they can perfect controlling bugs, they will be able to help amputees and people with neurological problems, feel their limits, and better control them. Helping amputees,etc - sure, it's a nice cover story. but all this stuff is DARPA funded? Do *all* univerties in america *have* to seek military research funding? Can your taxpayer funding dollars instead be directed into less vicious pursuits? All this recent DARPA funded research: remote drones, automatic weapon-armed robots, self-driving vehicles,etc and now you guys want to construct cybernetic-hybrid animals? Where are the wildlife agencies on all of this? But I worked for the Air Force and enjoyed making new weapon systems, but in all reality this technology is far way from making mind controlled rats that plant bombs. Again, I see more application toward helping amputees than serving as a weapons system. Look up some of the research the Duke University published in this area and you will see they already applied it to humans amputees or paraplegics.